Quick snapper to tell you about one of my favorite places in the South: Al Salam Pita. You can choose your own adventure as soon as you enter Al Salam. 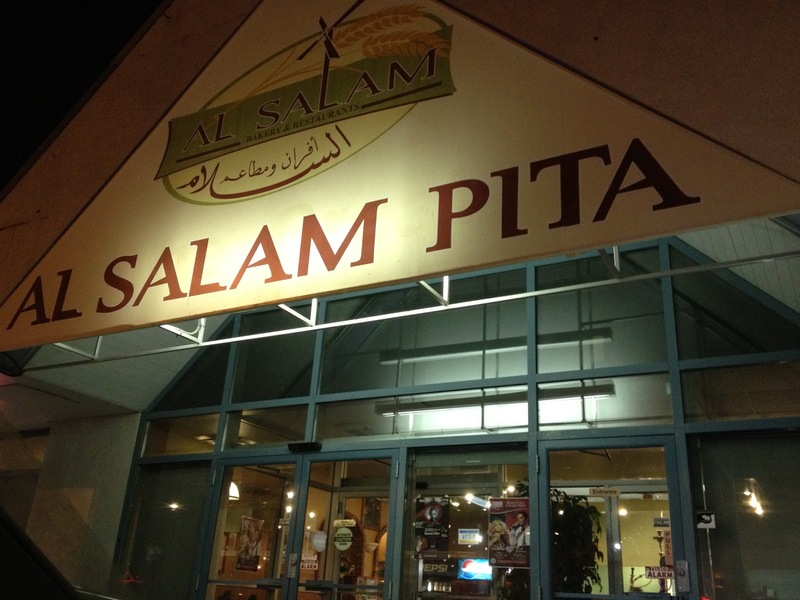 Go right to explore their Middle Eastern grocery store, turn left to enter their full-service restaurant, or straight ahead is the kitchen and take out counter. 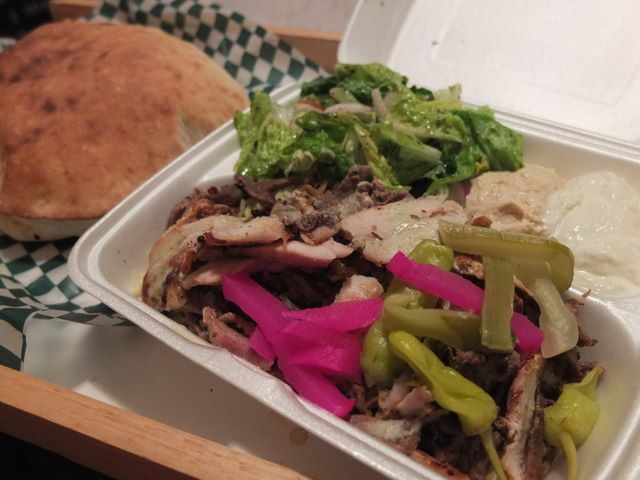 I am partial to the mixed shawarma platter. After being sliced from the spit, the beef and chicken are grilled a little bit more before being topped with pickled turnips, pickles, and peppers. The fatoush salad is a loaded with dressing, which always leads to it being a bit limp by the time it gets home. The thick hummus packs a wallop of garlic, which, as a garlic-lover, is something I don't complain about. 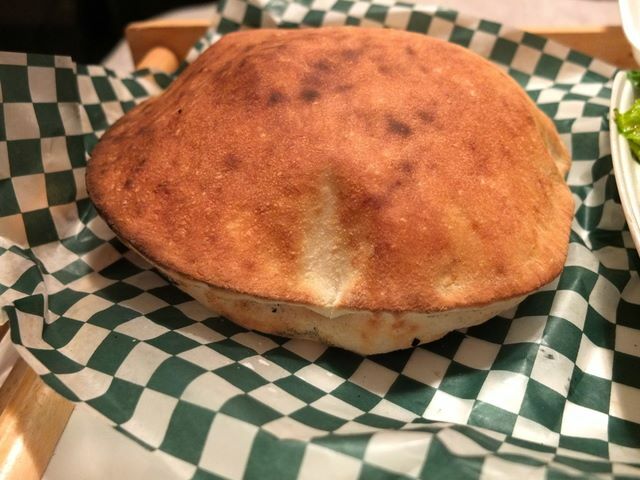 The pitas are made in-house, daily, and toasted as the other food is being prepared so that it's slightly crisp on the outside. The pita itself expands like a pillow and has an inside soft like velvet. I took me twenty years to try Lebanese food. I had no particular misgivings about it, but I was restricted by the limited options available in my small hometown. Shawarma was just another word I had no idea how to pronounce. Pitas were a finicky vehicle for tuna salad when I ran out of bread which arrived in bags, flat and lifeless, from the grocery store. Since discovering Al Salam Pita, I've ordered enough shawarma that I feel my pronunciation is getting pretty solid, and, man, now I know what a pita should really be. The mother of one of my oldest & dearest friends immigrated from central America, and, growing up, her house was often full of visiting relatives. Her family became like family to me, and I referred to to her grandmother as "Abuelita". Abuelita was not impressed with the food available in our local supermarket, so, when she was visiting, so you could count on finding a kitchen full of homemade food. Abuelita taught me how to make corn tortillas, and got me hooked on empanadas, tamales, coliflor envuelta en huevo, and pupusas. After moving to Edmonton, it took me about 12 hours before I found a restaurant to get my fix. Full disclosure: I love pupusas. No, really. I love pupusas. My first stop at Edmonton's Heritage Festival is always the pupusa tent, and the last time I visited taste of Edmonton, nothing looked as good as the pupusas, so I just spent all my tickets on them. 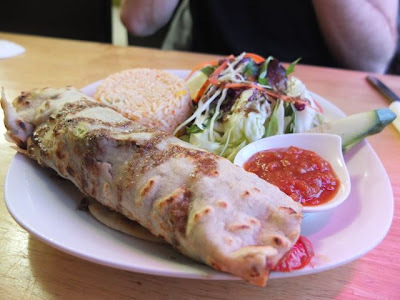 The Taste of Edmonton pupusas were, in fact, served by El Rancho, and when I visited the restaurant itself, I started with a couple to get my fix. 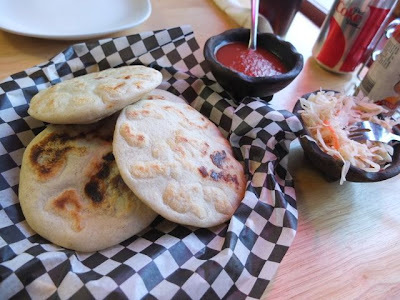 The pupusas were handmade, with a thin layer of filling inside the corn flour tortilla. My favorite is the cheese, bean, and pork blend (the revuelta) but other filling combinations are available. After loading them up with curtido (a cabbage slaw) and a thin & mild tomato salsa, I chowed down and was in heaven. Our entrees arrived not long after we'd polished off the pupusas. 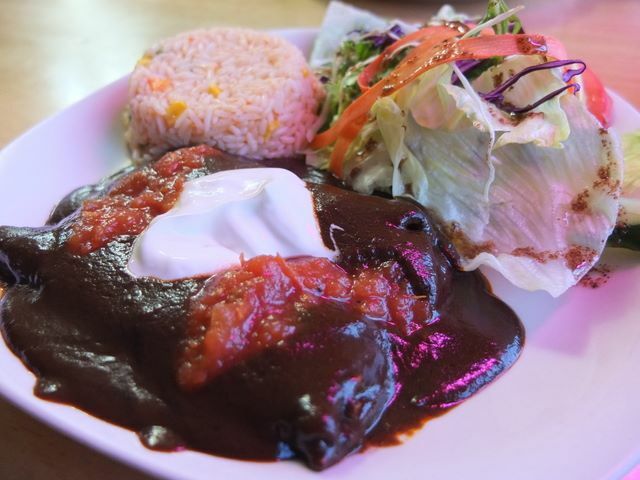 The mole sauce was thick with a deep flavor. While palate-pleasing, I did feel the enchiladas were close to drowning in it. The accompanying El Rancho salad was an unanticipated hit. It was drizzled, sparingly but adequate, in a dressing with a complex nutty flavor reminiscent of the mole. I rarely find burrito-sized corn flour tortillas locally, so I was really impressed that it was an option for the burrito al carbon. The tortilla itself was delicious, but even better wrapped around the the steak, pepper, bean and guacamole amalgam. Though I didn't order it at this visit, their tortilla soup is really wonderful pick-me-up on a cold winter day, and the tamales are the best I've found in Edmonton so far. 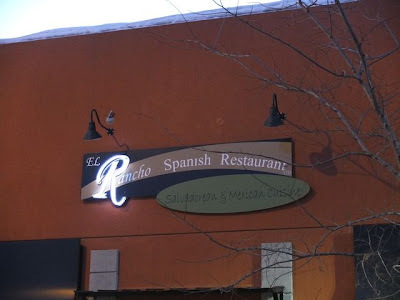 El Rancho was one of the first restaurants I visited when I moved to Edmonton, and, though it's hard to compare anything to Abuelita's cooking, with so many fresh, delectable offerings to discover, its kept me coming back. 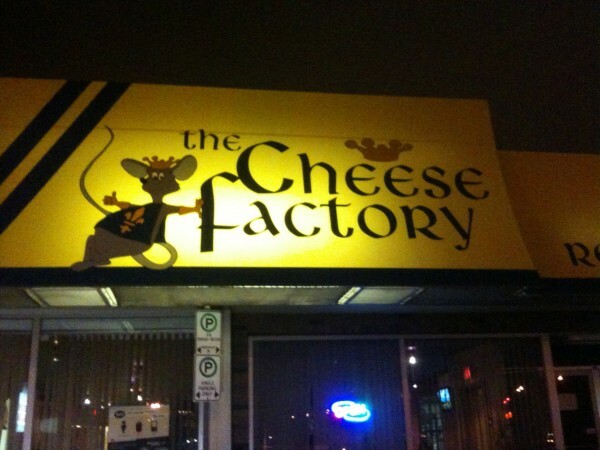 It took me a couple of tries to make it to the Cheese Factory restaurant when it was actually open. On more than one occasion, I've cursed the world as I futiley pull at their locked door, desperate for poutine. 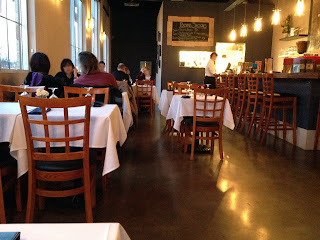 Check the hours before you go; they're only open for dinner on Friday and Saturday evenings. The Friday evening I made it in, I walked through their cheese store to find a busy restaurant with chatter in French buzzing from all directions. A good sign for their poutine, but it was interesting to find that, rather than being French, the owners are actually from the former-Yugoslavia, and the menu offers an ecclectic mix of Quebecois and Balkan favorites. 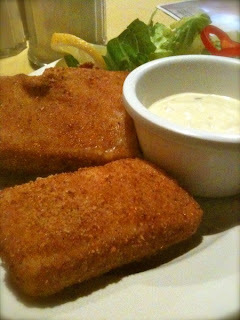 Unlike the pan-fried, flambeed, ouzo-drenched Saganaki I've had in the past, this fried cheese was coated with a crispy breading and deep-fried. The cheese inside was clearly extremely hot, gooey, and clearly fresh, I preferred them without the accompanying lemon dip. Discussions of the best poutines often lead to heated debates, and that night was no exception. While all of us at my table agreed the cheese curds were terrific, some preferred the fries with more potato skin, and others preferred a darker gravy. All of us did feel the gravy could stand to be a touch warmer in temperature. 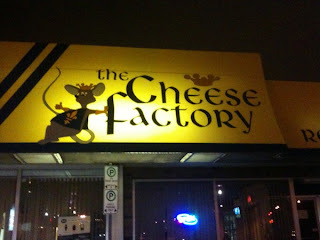 Best cheese curds in the city? Probably. Best poutine? Depends how much weight you give the other ingredients. I recently spent some time in Croatia, Bosnia, and Montenegro where cevapcici is a popular fast food. Ground meat is formed into sausage-sized portions and grilled. The cevapcici at The Cheese Factory was served on a soft bun with smooth & creamy kajmak, and each bite unleashed a pop of juicy flavour. I ordered a side of ajvar (a tradition red pepper relish) to complete the experience, but, for the hefty price of $2.50 for a small portion, I'd pass at future visits. Burek was almost a dietary staple on my trip, where they're found with many different fillings. 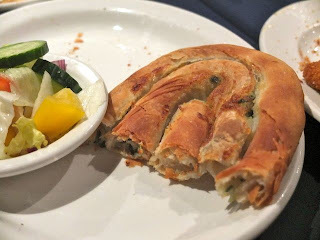 The spinach and cheese, however, was always my favorite, and was one of three options available at The Cheese Factory (along with cheese-only, and ground beef). It's freshly baked, so it took a few extra minutes to emerge from the kitchen, but this salty cheese and spinach blend, enveloped by rings of flaky phyllo, was worth the wait. Tufahija is a Balkan dessert of an apple poached in sugar and stuffed with walnuts. 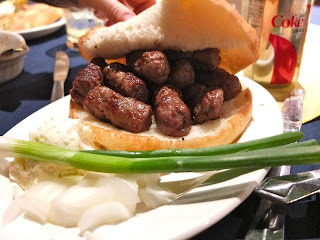 It's another dish I first tried in Bosnia, and has been etched in my memory ever since. It came out looking magnificent, but I was so stuffed that I had to push some of the whipped cream aside to get the apple itself. It was marvellous and did not fall short of my high expectations. 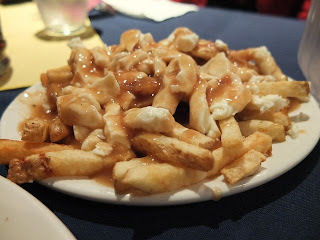 Though my party wasn't able to unanimously award the poutine as the best in the city, we agreed that the fresh, squeaky cheese curds left it at least among the top contenders. It's definitely worth a visit to see if it's to your liking, but don't ignore the rest of the menu when you're there! 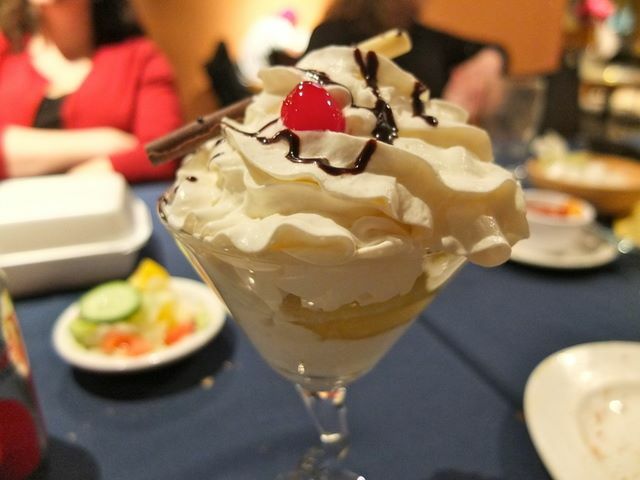 The Balkan menu items are a hearty, authentic and truly delicious experience. 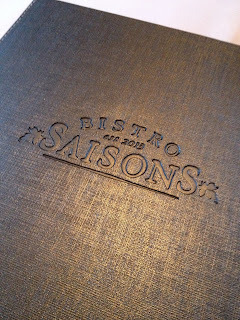 Bistro Saisons is a new restaurant in Oliver with a seasonally changing menu focused on season-congruent dishes and local ingredients. The restaurant opened so recently, in fact, that the signage of the former occupant of the location, 4th & Vine, is still present on the restaurant's exterior. The interior renovations appear to be more complete. 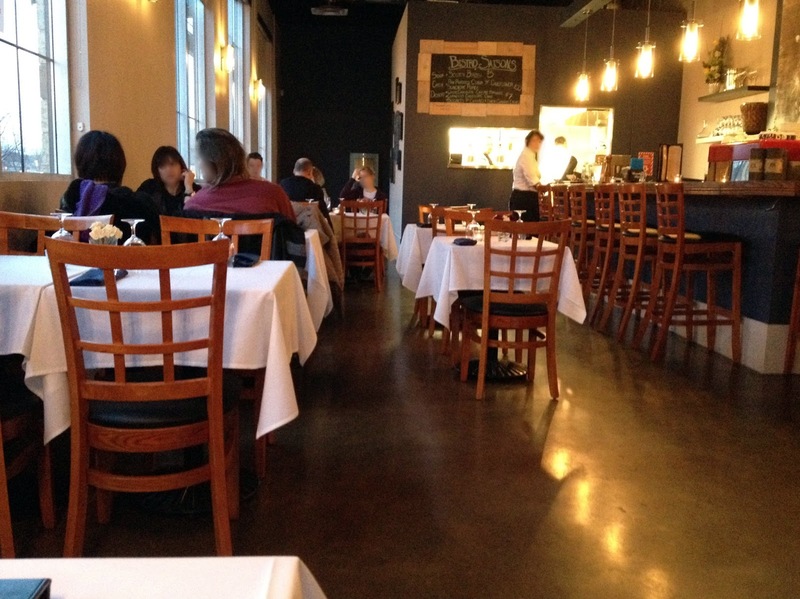 A deep blue accent colour, a remodelled bar, as well new light fixtures and chairs revivify the space. The vase of fresh flowers atop my bright white linen table cloth is a nice touch. 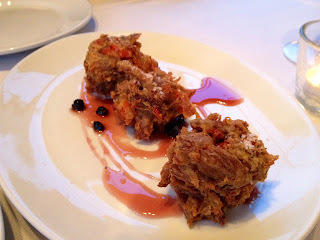 Crisp on the outside, the inside of the fritters are moist with the fat of duck confit & bacon with the occasional bite of red pepper to keep me on toes. They come with a Saskatoon berry reduction, reminiscent of a plum sauce in texture and sweetness, but with a notable berry twist. 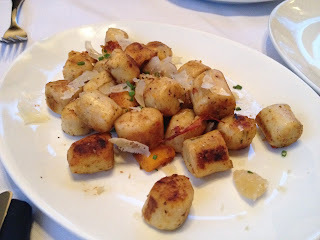 The homemade gnocchi are delectable. Cloaked in the rich and nutty aroma of brown butter, the slightly firm exterior gives way to a pillowy centre. Slivers of pecorino cheese deliver a salty punch, and a rare piece of butternut squash offers a hint of sweetness. While the meat of the pork shank comes off the bone with ease, I find myself wishing for more jus to offset the leanness of the cut. The acidic bite of the savoy cabbage, and the rich & creamy sauce of the potato "risotto" result in two contrasting, yet pleasing accompaniments. 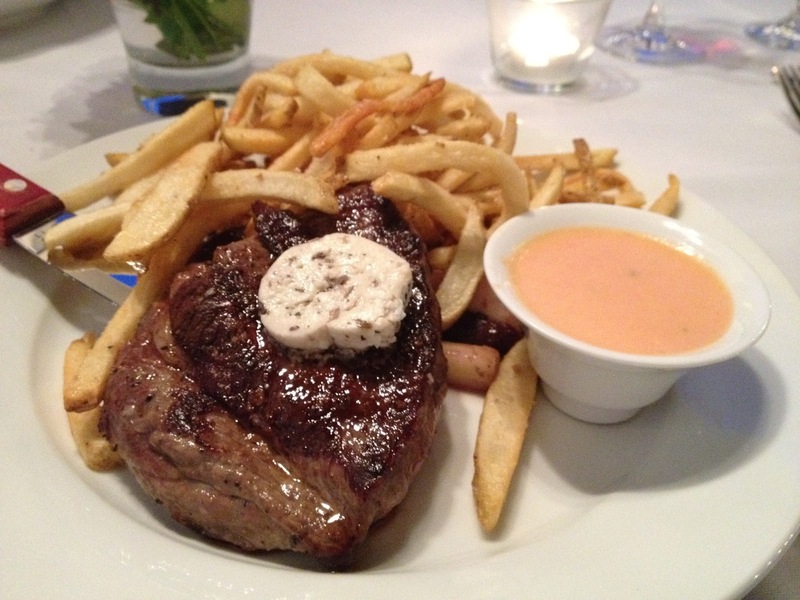 My Spring Ranch steak, topped with goat cheese mushroom butter and cooked to a perfect medium rare, melts in my mouth. It is the best I've had in some time. The accompanying fries are freshly cut and scented with pecorino. The smokey tomato aioli is the only disagreeable part of the entire meal. 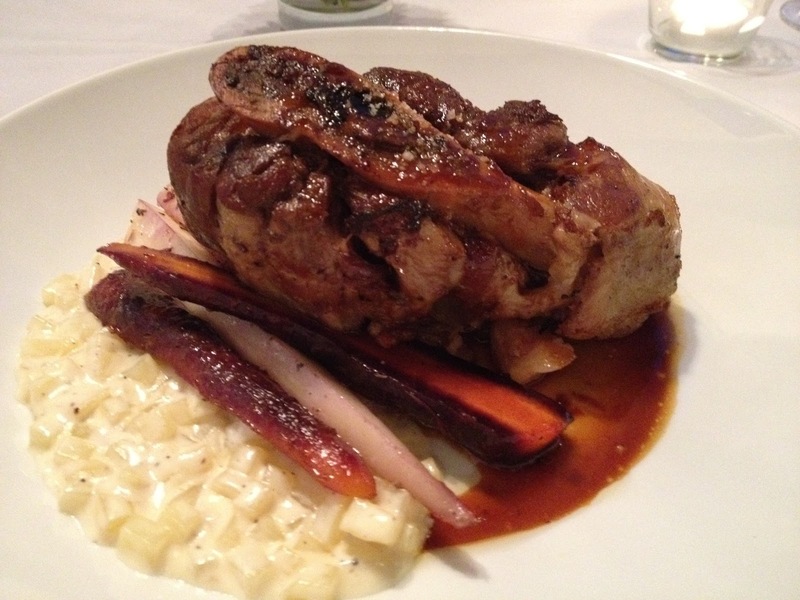 The seasonal inspiration and the emphasis on local, fresh ingredients came through in every dish at our visit. I look forward to returning to Bistro Saisons to see what other seasons will bring.